It's not surprising, really. My husband and I both play videogames, and I write about them professionally. Gaming has always been a part of my son's life. Before he turned 2, he would sit on the sofa with his dad, holding his GameCube controller face down. He navigated with his index fingers because his thumbs were too short to reach the analog sticks. But when I say that my son Pearce is a gamer, I mean that he was made for gaming. By which I mean, Pearce is autistic. He's got all the qualities you expect to see in a seasoned gamer: a good memory for detail, a knack for spatial relations, good hand-eye coordination and well developed reflexes. He perseveres in the face of frustration - he must conquer every challenge and win every achievement. He loves Guitar Hero, Spore and Super Mario Galaxy, and he's not even 4 years old yet. For him, gaming isn't just second nature - it's innate. So naturally, my husband and I use games to teach him important social and verbal skills. Having autism means that Pearce's brain is hard-wired to notice tiny details and memorize them instantly. He has amazing abilities that, in turn, generate a dizzying array of unique challenges. For instance, Pearce has a near-photographic memory that makes learning to sight-read words and recognize other visual cues easy for him. It also means that if he notices something has changed - and believe me, he will notice - he won't rest until it's put right. To this day, he will not allow us to put the protective silicone sleeves on our Wii remotes. He is convinced that they do not belong. Like many autistic people, he also has a really difficult time figuring out what information can be safely discarded. My son can't filter out noise from speech; he can't separate background music from spoken instructions. As a result, he can listen to a symphony and sing every note played by each instrument in the orchestra - but when I ask him for the fiftieth time to put on his shoes, he appears to be completely deaf. 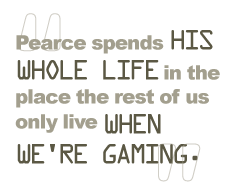 In other words, he spends his whole life in the place the rest of us only live when we're gaming. As soon as we noticed Pearce's propensity for electronic entertainment, we started thinking about how we could use it to his advantage. We needed a medium that captured his attention so that we could direct it towards things we really wanted him to learn, and videogames fit the bill. Beyond the usual "edutainment" titles on the market that teach kids to identify colors and letters, we needed games that would help us teach Pearce the function of language - that is, how to ask for what he wanted. Before he started talking, he communicated primarily with sign language. Pearce learned to bring me a GameCube controller and sign "game." Soon, he would sign and say "game" out loud. So we extended the challenge and asked him to choose between a two games: Mario 64 or Mario Galaxy? Choosing was difficult. He would respond echolalically: "Sixty-four galaxies."